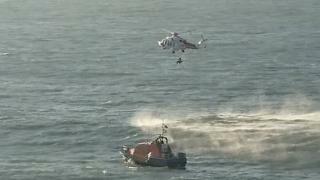 A coastguard helicopter plucked a sailor to safety from his sinking boat in the Irish Sea. A mayday call was received at about 08:00 GMT on Monday from a small boat which had got into difficulty on rocks near Gateholm Island, Pembrokeshire. The man was winched to safety by the helicopter and was uninjured, but the boat sank. Pembrokeshire Council and the Pembrokeshire Coast National Park are monitoring the area for debris.